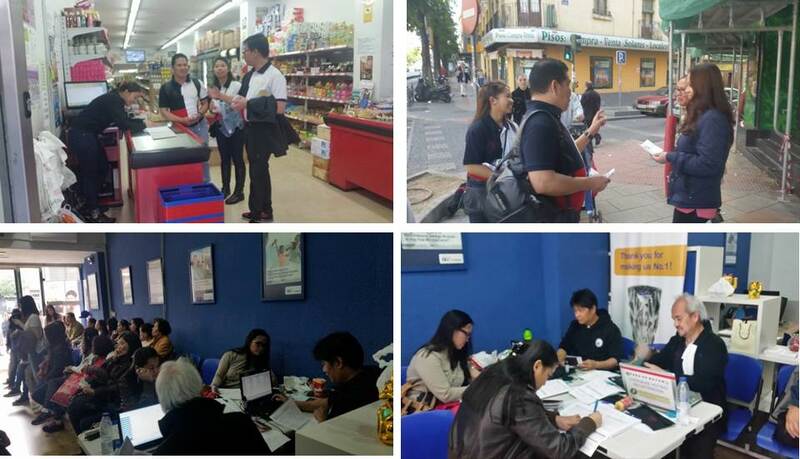 Philippine Embassy personnel distributed flyers in the streets of Madrid and in business establishments frequented by Filipinos to encourage them to register on the last day of the registration period. Mobile registration sites were also opened for Filipinos who wanted to register. The Philippine Embassy in Madrid closed the 2014-2015 overseas voter’s registration period on Saturday, 31 October 2015, at 5:00pm (Madrid time) with a bang. As early as 8:30 AM on Saturday, Philippine Embassy personnel were out in the streets of Madrid to distribute flyers and encourage Filipinos to register as overseas voters. Aside from opening the Embassy’s Consular Section the whole day of Saturday, the Embassy also established mobile registration stations in remittance centers in Madrid and Barcelona to allow Filipinos to avail of the opportunity to register during the last day of the registration period. Ambassador Carlos C. Salinas and Mrs. Isabelita T. Salinas spearheaded the registration campaign by registering at the mobile registration center, along with the overseas Filipino workers. The Ambassador also took the opportunity to encourage Filipinos to exercise their right to vote by first registering as overseas voters. Ambassador Carlos C. Salinas and Mrs. Isabelita T. Salinas registering at a mobile registration site. At exactly five o’clock in the afternoon (5:00pm), Consul General Emmanuel R. Fernandez (who also serves as Madrid PE’s Overseas Registration Focal Person), officially declared the overseas registration closed. Consul General Fernandez thanked the Filipinos for their participation and expressed hope that the same interest would be shown by them during the forthcoming national elections in 2016. (Photos L to R) Consul General Emmanuel R. Fernandez responding to questions from the crowd. Consul General Fernandez officially declared the registration closed at 5:00 PM on October 31. Ms. Analine Macaraig, an OFW from Oriental Mindoro, was the last registrant. She said that she considers it very important for her to register and vote because she believes that it is her duty to exercise her right of suffrage and be heard. She said that while her work requires her to be out of Madrid all the time, she made sure that she finished early that day to be able to catch the last day of registration. (Photos, L to R) Ms. Analine Macaraig was the last registrant in Madrid. OVR Team conducted registration everywhere, with or without table, as the above photo shows. Two months ahead of the deadline, the Philippine Embassy in Madrid reached the 10,000 new registrants target set by the Department on 28 August 2015 but continued its all-out campaign to encourage new registrants until the last day of registration on 31 October 2015. It has registered a total of 11,773 new registrants in 2014-2015, exceeding its target by 1,773.